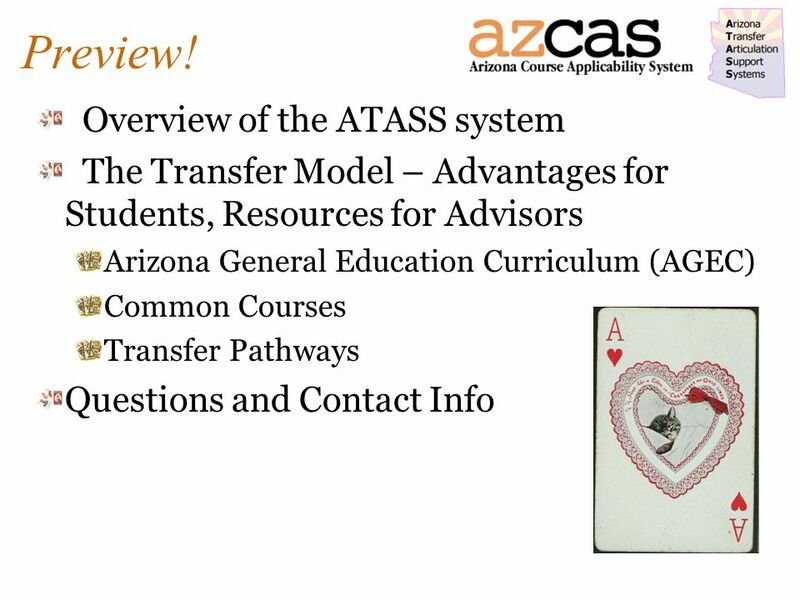 5 ATASS Overview - Advising Academic Advising Articulation Task Force (AAATF) Meets twice a year Met October 6, before this conference Addresses advising issues related to transfer Transfer Student Ombudspersons (TSO) At least one TSO on each campus Works with other TSOs to solve student transfer issues TSOs are also members of the AAATF Statewide Advising Directory Under construction, needs links from your school! 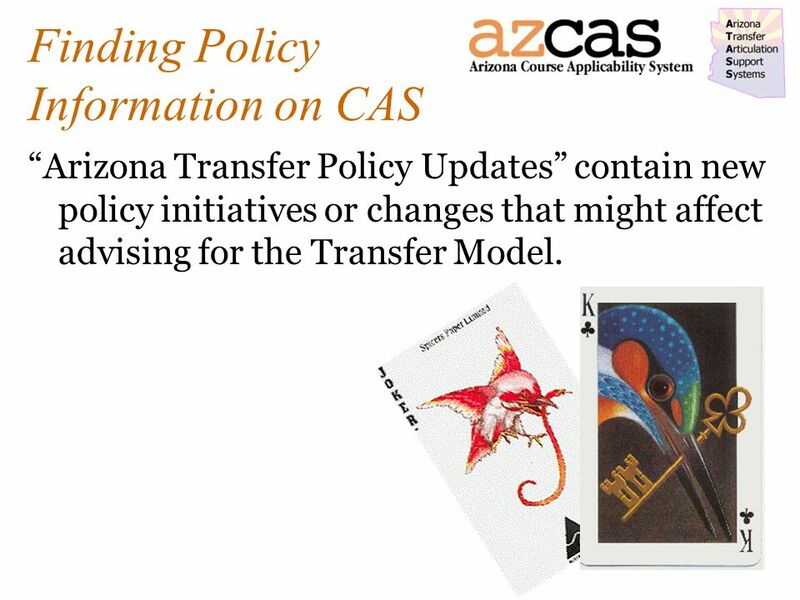 9 Finding Policy Information on CAS Arizona Transfer Policy Updates contain new policy initiatives or changes that might affect advising for the Transfer Model. 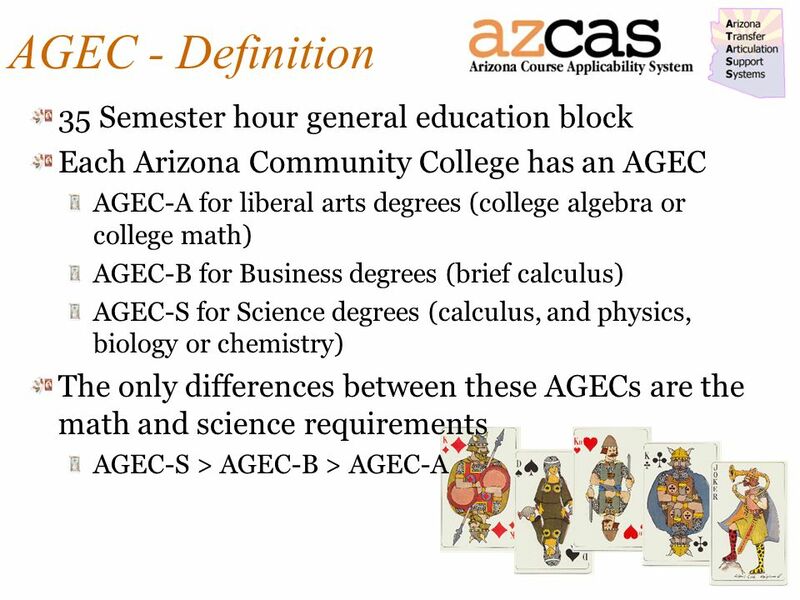 13 AGEC - Advantages Completed AGEC satisfies all lower-division General Education requirements at ASU, NAU, UA Completed AGEC guarantees admission to ASU, NAU, UA Completed AGEC seems to increase student success after transfer! 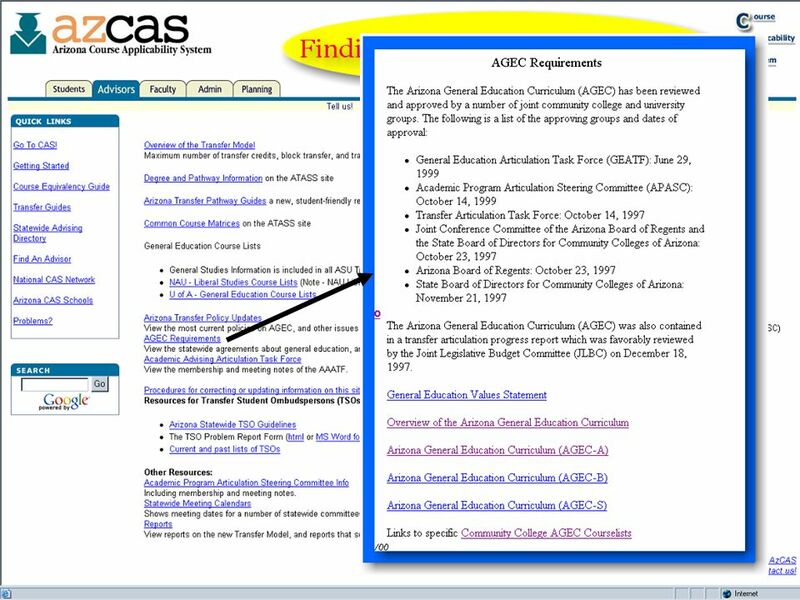 14 AGEC - Advantages Student TypeRetention – Fall 2002 Transfer with AGEC95% All PCC Transfer79% Non-Transfer (first enrolled Fall 2000) 68% For students from Pima to UA, Transferring Fall 2001 (1 year retention) Thanks to Dave Padgett of Pima Community College for sharing these statistics! 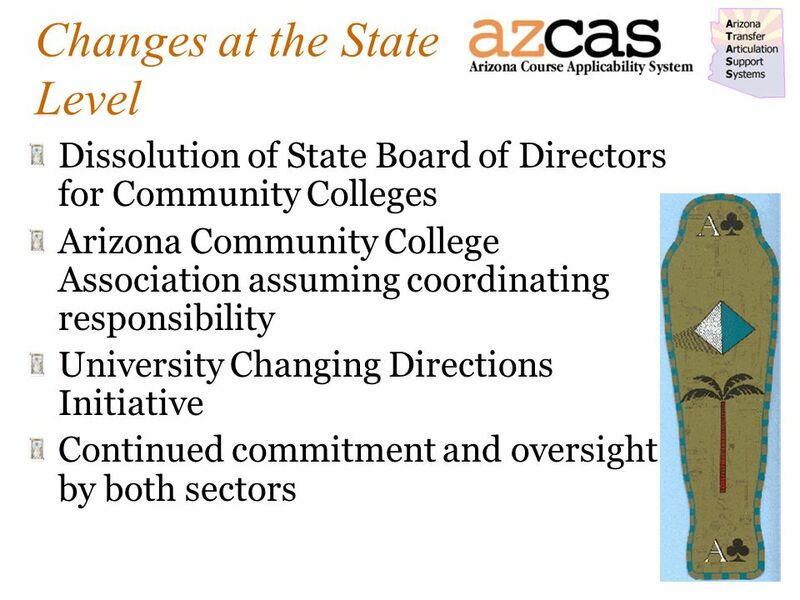 15 AGEC - Advantages Student TypeRetention – Fall 2002 Transfer with AGEC66% All PCC Transfer55% Non-Transfer (first enrolled Fall 1999) 63% For students from Pima to UA, Transferring Fall 2000 (2 year retention) Thanks to Dave Padgett of Pima Community College for sharing these statistics! 16 AGEC - Advantages Student TypeCum. 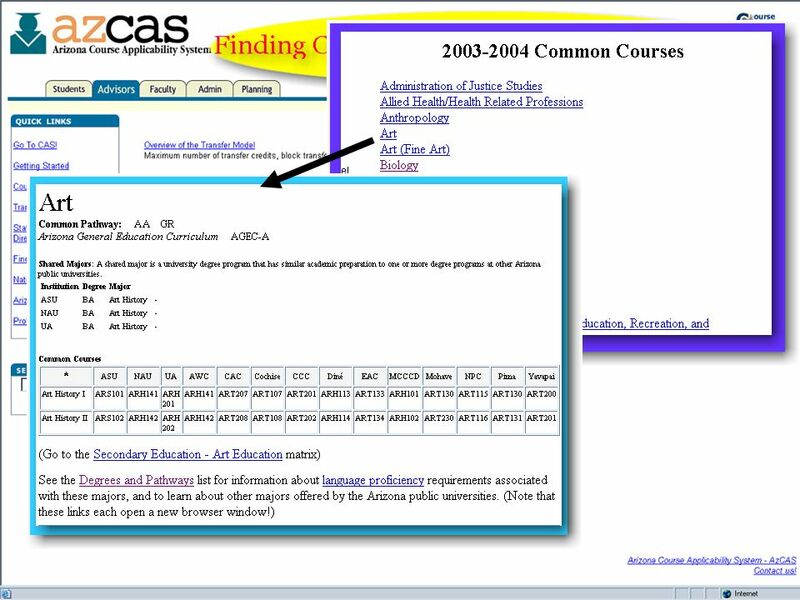 Graduation Rate thru 2002-2003 Transfer with AGEC65% All PCC Transfer37% Native (first semester Fall 1998) 31% For students from Pima to UA, Transferring Fall 2000 Thanks to Dave Padgett of Pima Community College for sharing these statistics! 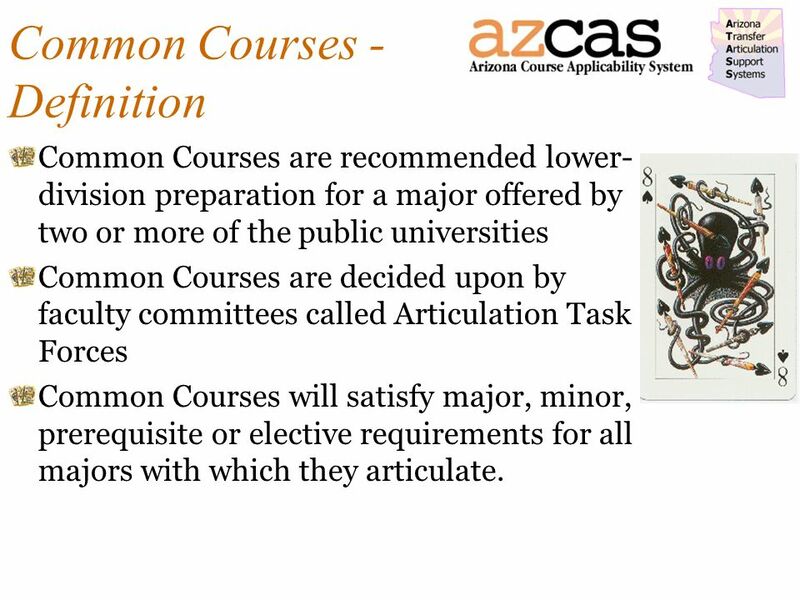 18 Common Courses - Definition Common Courses are recommended lower- division preparation for a major offered by two or more of the public universities Common Courses are decided upon by faculty committees called Articulation Task Forces Common Courses will satisfy major, minor, prerequisite or elective requirements for all majors with which they articulate. 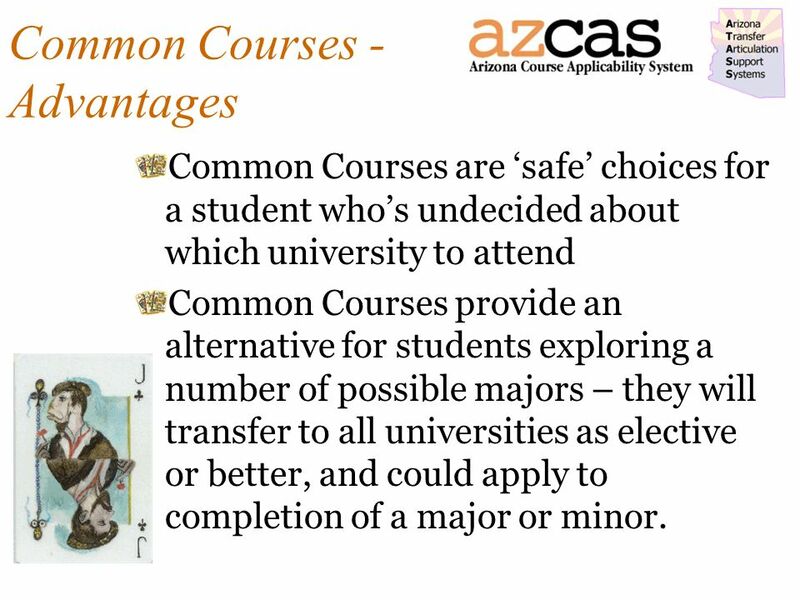 19 Common Courses - Advantages Common Courses are safe choices for a student whos undecided about which university to attend Common Courses provide an alternative for students exploring a number of possible majors – they will transfer to all universities as elective or better, and could apply to completion of a major or minor. 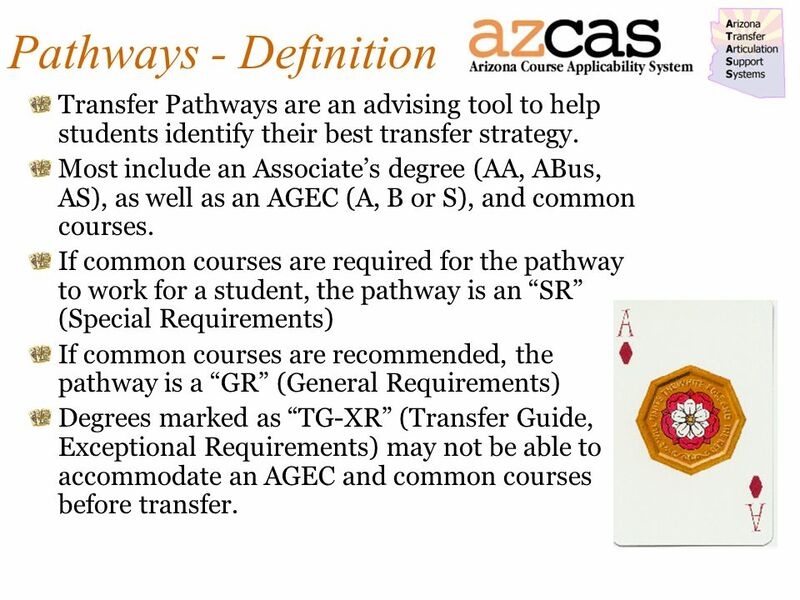 22 Pathways - Definition Transfer Pathways are an advising tool to help students identify their best transfer strategy. 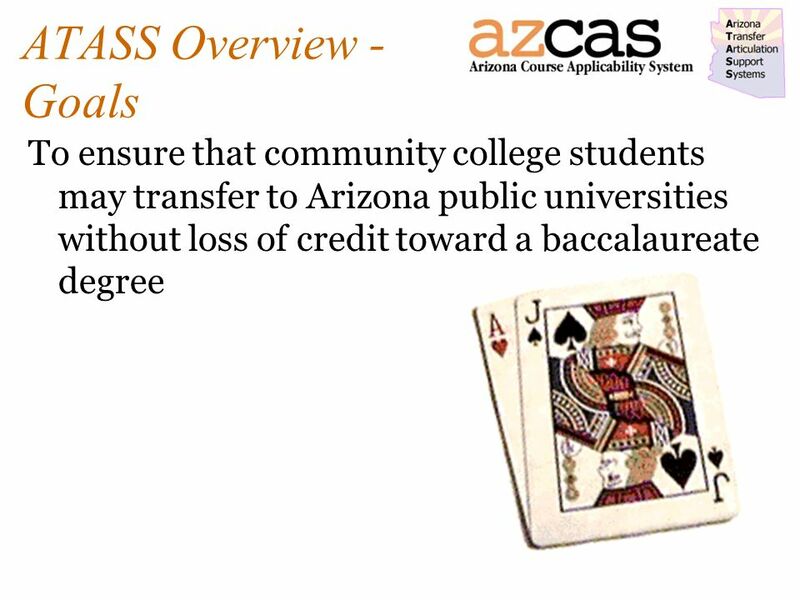 Most include an Associates degree (AA, ABus, AS), as well as an AGEC (A, B or S), and common courses. 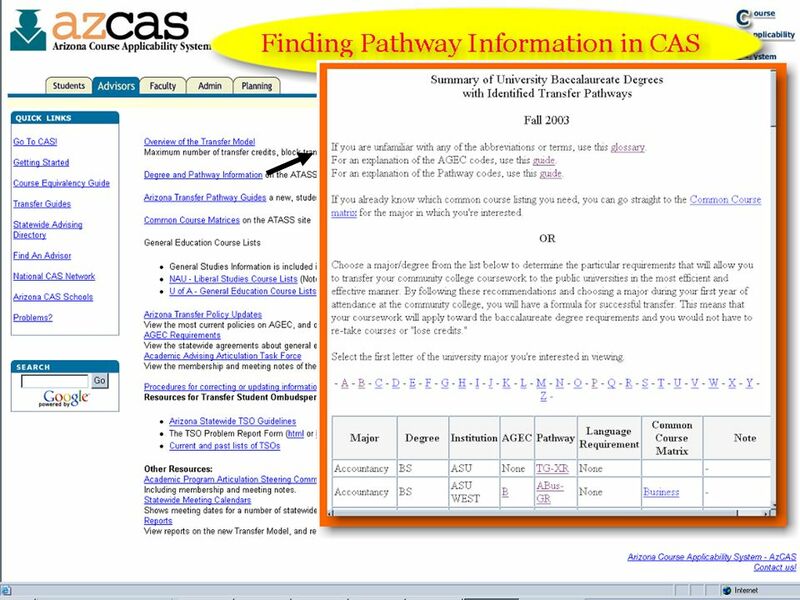 If common courses are required for the pathway to work for a student, the pathway is an SR (Special Requirements) If common courses are recommended, the pathway is a GR (General Requirements) Degrees marked as TG-XR (Transfer Guide, Exceptional Requirements) may not be able to accommodate an AGEC and common courses before transfer. 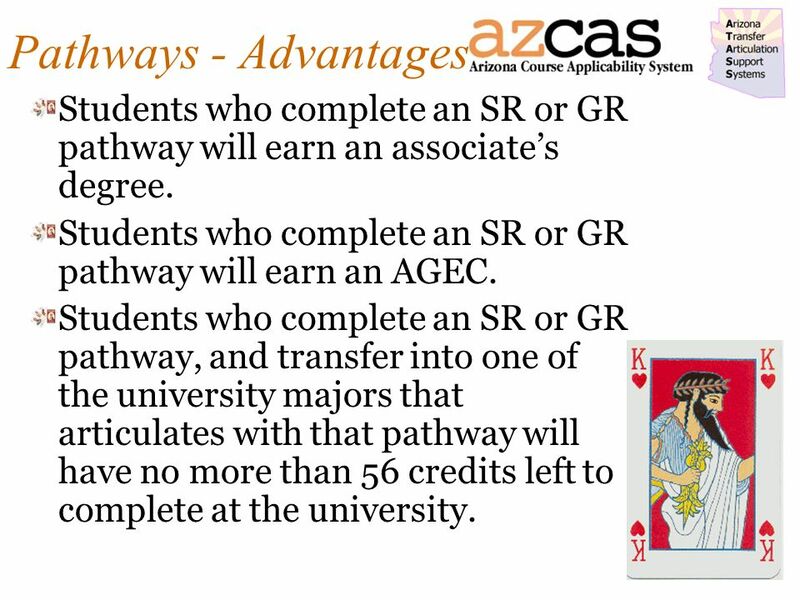 23 Pathways - Advantages Students who complete an SR or GR pathway will earn an associates degree. Students who complete an SR or GR pathway will earn an AGEC. Students who complete an SR or GR pathway, and transfer into one of the university majors that articulates with that pathway will have no more than 56 credits left to complete at the university. 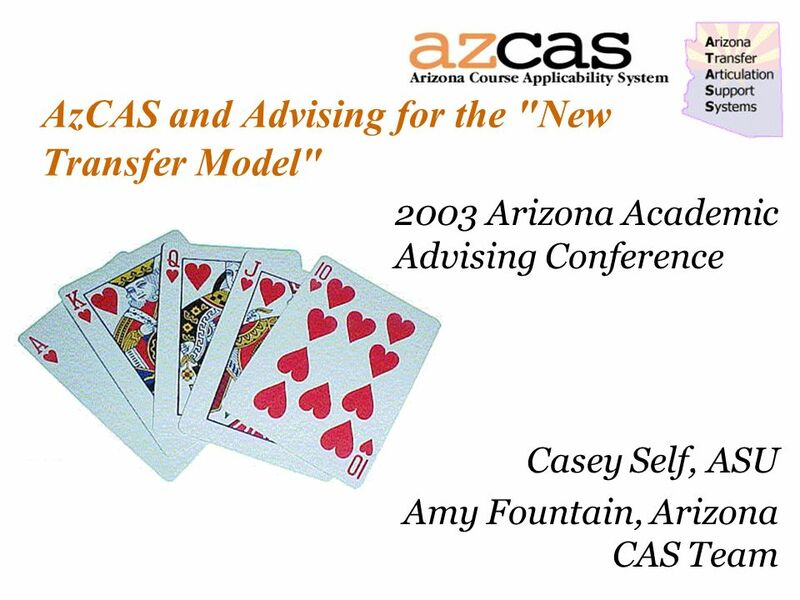 Download ppt "AzCAS and Advising for the "New Transfer Model" 2003 Arizona Academic Advising Conference Casey Self, ASU Amy Fountain, Arizona CAS Team." 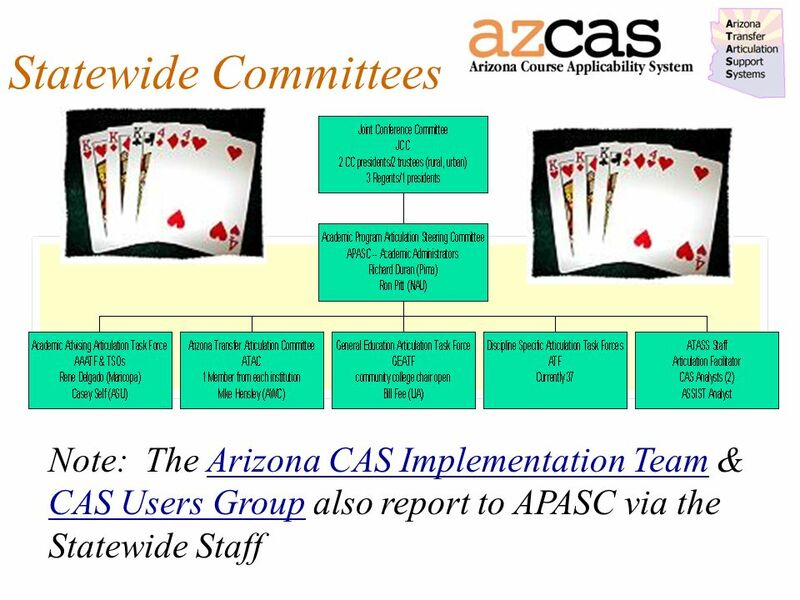 An Arizona Course Applicability System (CAS) Users Presentation Kristy Jacobs North, ASU DARS Millie Torre, ASU DARS. 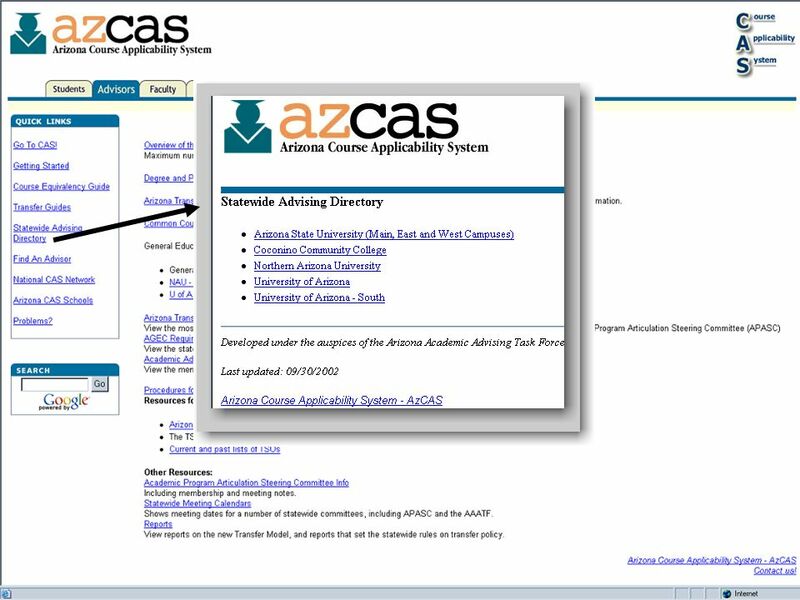 The Arizona Course Applicability System: Uses for Admissions and Advisement Amy Fountain, Ph.D. CAS Transfer Analyst, AZ For. 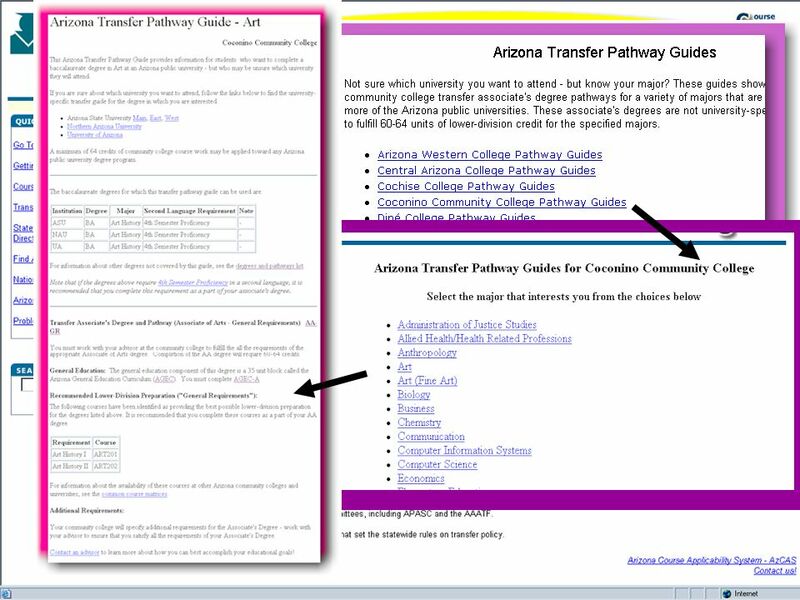 University of Wyoming CREDIT TRANSFER EVALUATION STEPS. 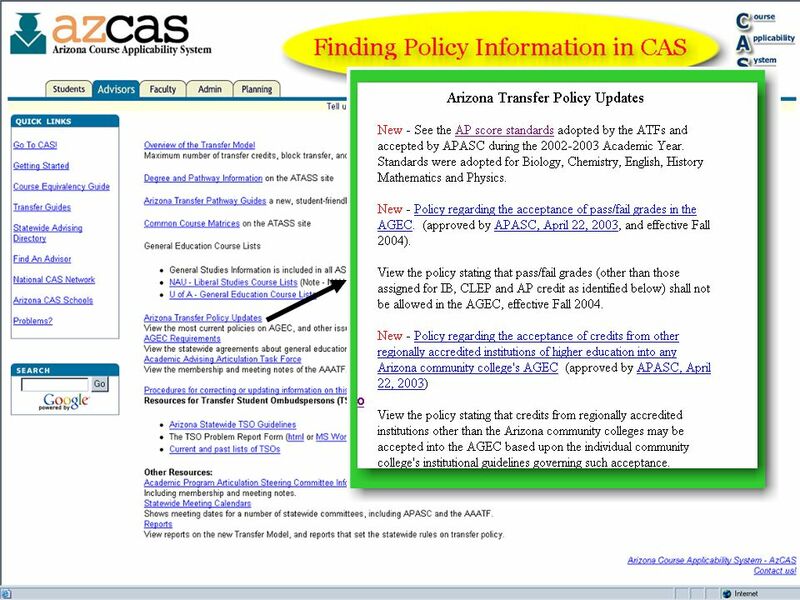 CAA Information Session Comprehensive Articulation Agreement Update. Teacher Education & Induction in the US Johnny Lott & John Carter. Presented by Student Support Services. 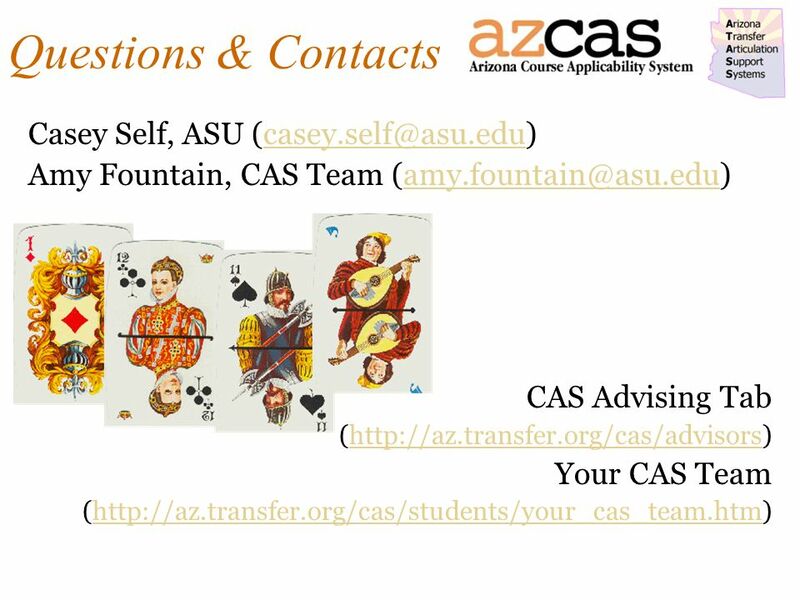 Frequently Asked Questions  What is a college transfer student? Community college transfer students are those. ArkACRAO Fall Conference 2009 October 8, 2009 Rogers, AR Transfer Reporting by Rick Jenkins Associate Director for Planning and Accountability Arkansas. Chris Terry Denise Darre Miko Price. Counselors Chris Terry – A –G Miko Price – H – O Denise Darre – P – Z Ginny Walters – College and Career Counselor. 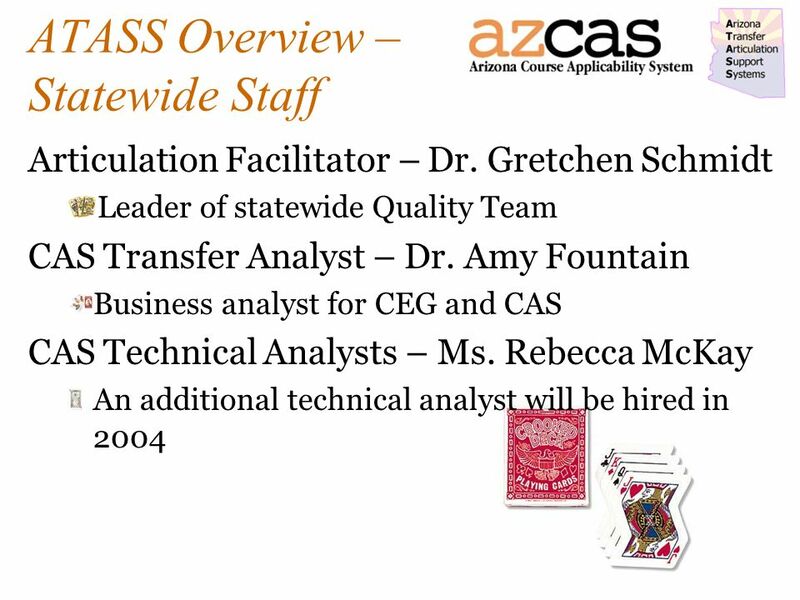 Florida’s 2+2 System of Articulation Matthew BouckHigher Education Coordinating Council Interim Director, Office of ArticulationJanuary 28, 2011 Matthew.